The folks behind the Detroit Evolution Laboratory--last spotlighted here as the inaugural Detroit Stories feature here at Isak--now have a new space to speak about a sustainable city (in all its forms). 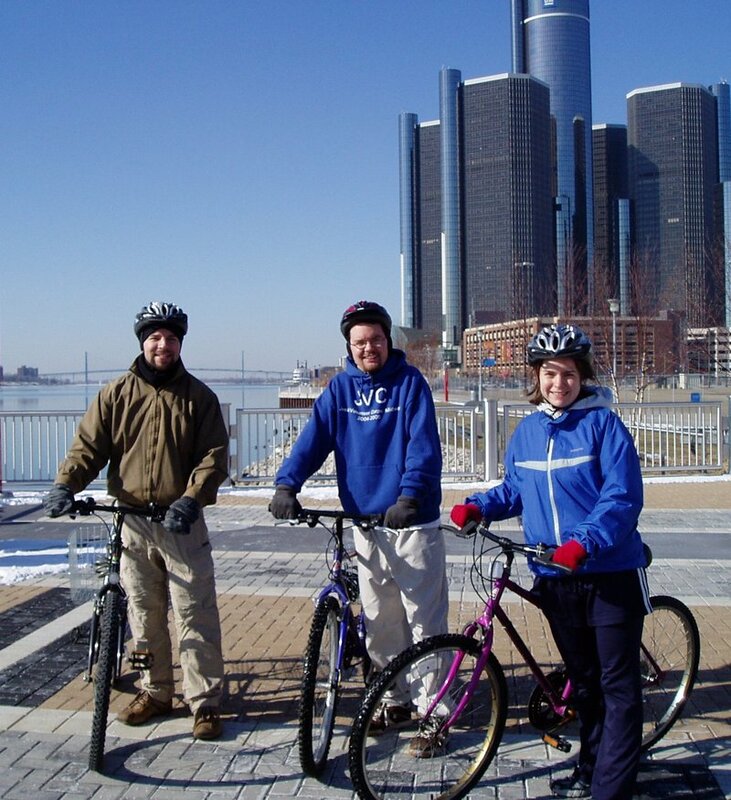 Their column, "Healthy Detroit," is a new regular at The Detroiter. You won't want to miss it--whether you're a local or not. 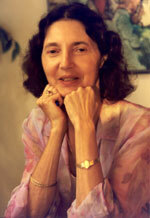 Women's eNews eulogizes Barbara Seaman, the writer, journalist and health advocate. It's an astonishing story. Seaman died on Wednesday. "... Although not trained as a medical specialist, she was skeptical and knew how to investigate, which made her one of the first female science reporters in journalism history. Because she was a muckraker and a troublemaker, continuing for nearly 40 years to take on the pharmaceutical industry for the harm its drive for profits caused and the cover-ups it promoted, she was often blacklisted from magazines and denied a voice on television. It was not an easy career path. Yet she produced four more books and many short pieces, spoke on innumerable panels and was a familiar figure at demonstrations." Women's Voices, Women's Vote is "is honoring those women that have utilized the internet to amplify their voices" in celebration of Women's History Month this March ... and they're taking your nominations for favorite female blogger. I would be honored if you voted for me and Isak! ... how jazzed I am--yes, jazzed--that "No Country for Old Men" did so well at last Sunday's Oscars? Not that I saw most of its competition, but, as I pontificated earlier, NCFOM is plain old brilliant. Thank you, writers Coen and McCarthy. I was particularly delighted with Javier Bardem's win--and with the discovery that Bardem is the very same man who blew me away playing Reinaldo Arenas in "Before Night Falls" years ago. Utter transformation. Just call me a fangirl. One quibble: it didn't take me long to get over hearing news accounts of the Oscars describing NCFOM as a movie "about" drugs, murder, money, a psychotic killer. All those things are present, sure, but the film's about very different things. See previous pontification. I was also satisfied that so many non-Americans got props. All the acting awards went to Europeans (I simply must see "La Vie en Rose"). Same with the best song category, and documentary, and short film, and short animated film, and several others. "Persepolis" didn't pick up the props it should've gotten, but in all, it was a good night. And with Jon Stewart keeping me company throughout it, I couldn't have been happier. My interview with writer and thinker Marguerite Bouvard is the latest in the feminist interview series over at the Center for New Words. "Marguerite Bouvard is a true multidisciplinarian. As a poet, nonfiction writer, and political scientist, she’s published 15 books, covering everything from the Madres of the Plaza de Mayo to feminism and aging to the role of prayer in hard times. "Her most recent title is Healing: A Life with Chronic Illness, which is described as a 'practical and spiritual guide;' Bouvard focuses on her experience living with interstitial cystitis, among other illnesses. "Bouvard is part of the Women’s Studies Research Center at Brandeis University and is a regular contributor to Women’s Voices for Change, an online community which seeks to transform the way older women fit into our culture." 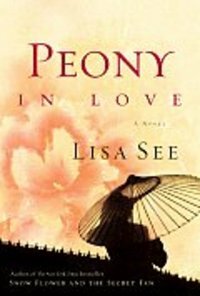 Here's your chance to get Lisa See's fifth novel, Peony in Love, delivered directly to your door for free! Just a little gesture of my affection for you. Publisher's Weekly calls it "a coming-of-age story, a ghost story, a family saga and a work of musical and social history." Set in 17th century China, the novel (newly released in paperback) follows Peony, a wealthy 15-year-old girl who discovers the (real life) opera, The Peony Pavillion, written by Tang Xianzu in 1598. It obsesses her (apparently the opera has a reputation for doing just that to generations of Chinese women, even to the point of causing the 'lovesick maidens' to starve themselves to death). As a narrator, Peony dies at 16 and continues her story as a "hungry ghost"--or, as The Washington Post review describes it--"a starveling wisp of air who cannot negotiate corners and must avoid mirrors and swords." Meanwhile, the time-bending text carries the reader over unexpected leaps and unusual pacing. "See (Snow Flower and the Secret Fan, etc.) offers meticulous depiction of women's roles in Qing and Ming dynasty China (including horrifying foot-binding scenes) and vivid descriptions of daily Qing life, festivals and rituals. Peony's vibrant voice, perfectly pitched between the novel's historical and passionate depths, carries her story beautifully—in life and afterlife." Want it for your very own? Be the fifth person to email me at annaleighclark-at-yahoo-dot-com with your name and mailing address! Feel free to let me know if you prefer the spanking new hardcover or the paperback edition of Peony in Love. We're all about pleasing the customer over here at Isak. Just a reminder: only folks who have not been an Isak Book Giveaway winner in the last six months--that's up to and including August--are elgible! If you have questions about your elgibility, please email me and we'll sort it out. UPDATE: Congratulations to Beth Bovair of Arlington, VA! Anna Hull and Diana Priest's investigative writing on the poor care and management at Walter Reed Army Medical Center win this year's Selden Ring Award for Investigative Reporting, worth $35,000. The articles were published in The Washington Post. "If it were not for these two reporters, our veterans would continue to suffer needlessly and unconscionably," added Michael Parks, former editor of the Los Angeles Times and current director of the Annenberg School of Journalism. "This is exactly what investigative reporting should do. Hold the government accountable to its people." How Will Traditional Media Participate in Our Current Participatory Media Culture? It's the age of user-generation. You've heard it before: these days, everyone's a media-maker. The citizen journalism movement--marked by YouTube, breaking news caught on a cell phone camera, Indymedia and other news sites where communities represent themselves, and, of course, blogs--has caused an upheaval in our standard media model of one-way communication from an authoritative periodical or anchor. It's democracy in action, baby, and I'm all kinds of excited about it. So how are the standard media models adapting? Well, the major news organizations now have branches that are built by user generated content (UGC). All well and good. But in The Guardian, Jemima Kiss takes a moment to wonder if its a viable adaptation for them. "'There has been a degree of tokenism in implementation. It is often very difficult for editors to understand the technology - some newspapers do very well others not so well. And several editors said they felt they had to try not to be behind and had not built those communities properly.'" "Last April, I suggested Michael Chabon's The Yiddish Policemen's Union "had an equal chance of winning... the Hugo AND the Edgar," and, well, it's getting a lot closer to happening. 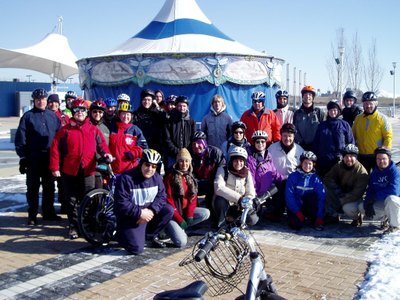 ..."
It was a brisk, shining day; the perfect sort for a winter ride. 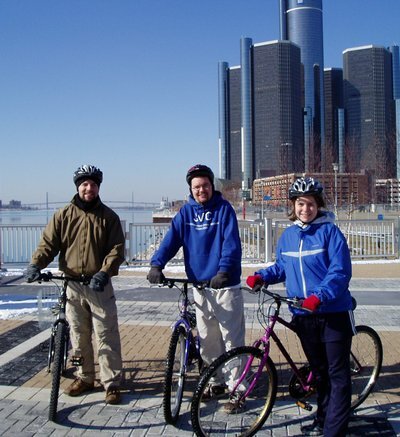 We took our time over the 12 miles, stopping at the new Café con Leche in Mexicantown and, of course, for obligatory photos on Detroit's Riverfront (that's Canada on the other end of the Ambassador bridge there). I took a lot of heart in biking through the city, both for the chance to explore neighborhoods I don't (yet) know well, and because I loved being part of cycling pack. One little girl pointed to us open-mouthed while her mother laughed; I think she thought we were a parade. Pedestrians, and a few other bikers, waved cheerily. And in the Motor City, where the cycling community is still small but fervant and there's scanty little public transportation, it feels significant to pedal through the streets. Not only is it a public pronouncement of alternative transportation and ridiculously fun (my body still hums with delight at being outdoors and active), it's also an invitation to community and friendship. Why don't you join us? is the implicity question in group rides. Why don't you too revel in the city streets as spaces for something other than moving as swiftly as you can from one location to another?